Whether rolling along the beach on the Coaster or around the city on the trolley system, riding San Diego’s rails is a great way to get to know the city. And no matter where you stop off, you’ve got immediate access to the region’s world famous culinary and craft beer scene. Pick a stop, any stop. Even beyond the beach and the bites, Solana Beach is a draw for music fans headed to the Belly Up Tavern just steps from the Coaster stop. There’s no need to get your groove on empty-stomached. Right across the 101, O.B.-born Pizza Port serves its pies and grog, as it likes to call its signature beers. For something a little more refined, try Pacific Coast Grill and its menu of lobster tail, pan seared seabass, and paella. 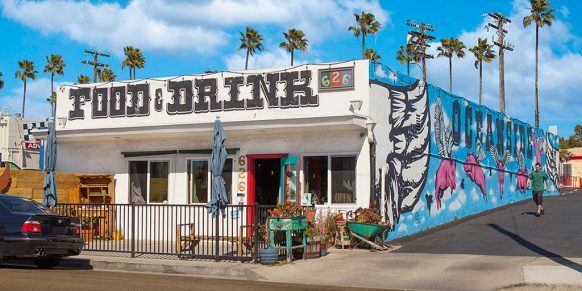 A walk along Encinitas’ enchanting shoreline pairs well with light fare, which Encinitas Vegan Experience has much of. Its smoothies, bowls, salads, and tacos are all meat- and dairy-free, but full of positive vibes – just like the town itself. If it’s real dairy you’re looking for, Handel’s Homemade Ice Cream has that by the scoop. The food scene in this area of Carlsbad, a stone’s throw from the Coaster station, is hot—starting with the wood-fire menu at Campfire. The décor makes the space feel like a campground in a National Park, but when was the last time you ate wood-smoked rib eye on a camping trip? More indoor vibes can be attained inside the historic Victorian home that houses The Land & Water Company, which focuses on sustainable sushi and sashimi. Diners come for more than pork (octopus, for one) at Flying Pig Pub and Kitchen, a gastropub that many credit with igniting the culinary boom currently underway in South Oceanside. Just a stone’s throw from Flying Pig, in a former BMW dealership, is Bagby Beer Co. In addition to dozens of house-brewed beers, the scratch kitchen turns out things like sriracha corn dogs, braised short rib hoagies, and house-ground burgers. You could hardly ask for a more restaurant-rich destination than downtown San Diego, where the trolley will deliver you walking distance to far too many eateries and watering holes to name. Less than two blocks from the trolley station you’ll find the craft brews for which Karl Strauss Brewery & Grill has won over 100 major competition medals. And, because in San Diego we have an embarrassment of riches when it comes to the weather, you can feel good about entering the dark and leathery environs of Lion’s Share. Their menu of well-regarded cocktails and game meats like wild boar Bolognese, chicken fried quail, and coffee-rubbed elk loin doesn’t hurt, either. The trolley’s Fifth Avenue stop offers easy ambling distance to Biga, an Italian eatery whose pizza is made from a 200-year-old dough starter. For something meatier, check out San Telmo, an unassuming spot for Argentine fast-casual. Those looking for gluten-free and organic fare should visit Café 21, where the brunch menu sports everything from tiramisu pancakes and lamb omelets to shrimp pesto sandwiches. 18th Century vibes are not all that Old Town has to offer. When you’ve worked up an appetite strolling the area, which dates back to 1769, listening to the resident mariachis, and watching blacksmiths at work, head to Casa de Reyes. The menu of classic Mexican dishes like chilaquiles, tamales, and fajitas is accented daily by live music and folkloric dancing. If riding the rails to La Mesa, stop into Farmer’s Table and enjoy what the 1940 tractor in the bar is trying to tell you: this place prides itself on farm fresh cuisine (ditto for its reclaimed decorations). Pastries, kombucha, a tattooed clientele – Public Square Coffee, also in the neighborhood, has everything above and beyond coffee that a hip java hut might require. No visit to Chula Vista would be complete without a stop at Tacos El Gordo. The street-style tacos at this very casual spot have been inducted into San Diego Magazine’s Taco Hall of Fame, a list only 20 tacos long. Not impressed? The place has a 4.5-star rating on Yelp with an impressive 3,431 reviews. Still not impressed? Try the tacos. Rolling through Grantville? For a taste of the home-grown craft beers San Diego is famous for, check out the family-owned Benchmark Brewing Company, headed up by Matt Akin of Alesmith Brewing Company fame.